Large 5 bedroom plus sleeping loft , 3 bath, Hot Tub, 6 HDTV's, Pool Table, fireplace, wrap around deck with seating, Privacy, 2.5 miles from the Lake at Kings Beach in a quiet neighborhood surrounded by forest land and hiking trails,and snowplow. 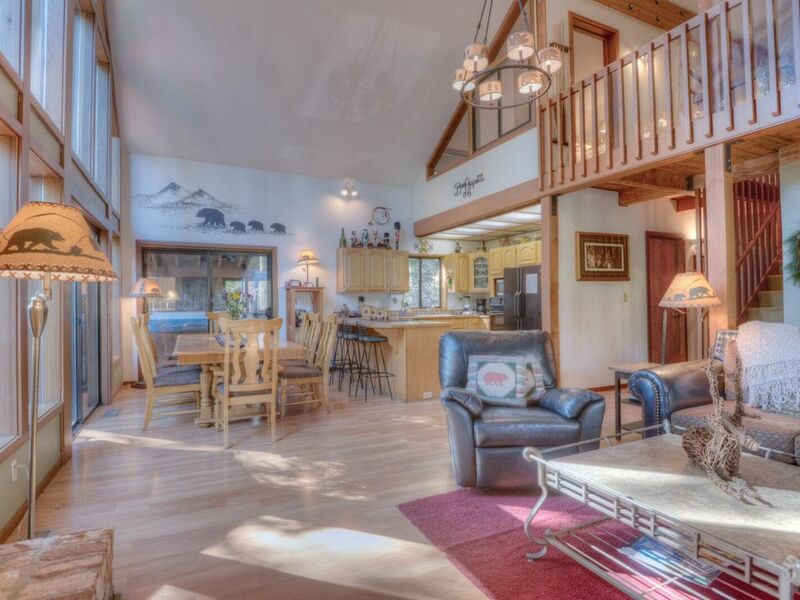 This well appointed home is 2.5 miles to the sandy beaches at Kings Beach on Lake Tahoe. Voted the best beach on the Lake, Kings Beach is a state park with lifeguards, jet ski's, paddle boats and kayak rentals, and has a multitude of shops, restaurants and bars. You can walk from the house to Tahoe Vista Regional Park which offers Frisbee Golf , tennis courts, ball fields, dog park and a sledding hill with snowmobile rentals in the wintertime. Nightlife is 3 miles away with casinos, live music, and spa services. Located in a quiet pocket of homes, you can hike, bike, or cross country ski right out the back door. All the roads dead end at trail heads and there are tons of hiking and biking trials. The neighborhood overlooks the lake and most homes sit on a meadow with tall trees and an abundance of wild life. With five bedrooms plus sleeping loft, three baths this home is ideal for a large family or group of friends. As you walk in the front door, you'll be greeted with 22 foot floor to ceiling windows that lookout to a tree-lined wrap-around deck. This is the 'Great Room' and lives up to its name. Big beams expand across the ceiling and the effect is dramatic. Two sliding glass doors exit out to the deck with a BBQ, patio furniture, and privacy with wrap around seating and hot tub. The hot tub sits on the side deck and you can watch the wildlife in the meadow while you soak in the hot tub The large living area is an open floor plan which opens into the kitchen, and dining area. A overstuffed sectional with scattered ottomans faces a large brick wood burning fireplace, and 50' HD Smart TV. and entertainment center with DVD player, iPod and stereo, books and games. From anywhere in the Great Room and loft, you look out the expansive floor to ceiling windows. There is nothing like watching the snow fall while sitting on the couch in a nice warm house. 2 trees go through the deck which throws is squirrel climbing as a good source of entertainment. Adjacent to the living room is the kitchen and dining area. The kitchen has lots of counter space and is equipped with all the amenities you need for your group. Plenty of cooking space will allow lots of chefs to participate. The dining area has a 12 top table with additional counter bar space with 4 stools. When the sliders are open, this becomes an extention of the patio tables outside. A walkway from the living area adjoins laundry facilities, full bathroom, and 3 bedrooms. . The first bedroom is a Master with King bed, twin bed, TV, and full bath. This room is large with lots of closets space and provides good spot for a family with children or elders who wants to be on main level. Down the hall has a queen bed with TV and windows looking into the meadow. The other room has a queen bed with TV. Because Lake Tahoe's motto is just 'play hard' extra attention has been given to a great bed and a good nights sleep. All the bedding is Hotel Style with memory foam mattress pad, luxury 300 count sheets, 4 down or down alternative pillows, duvet, and bed throw. You'll feel like you're in an upscale hotel. Upstairs is another Large Master bedroom with King bed, and twin bed and TV. Vaulted ceilings, wooden beams and lots of windows that look out into the forest really make this room special. This connects to a redwood paneled bathroom with separate shower, and a two person whirlpool jetted bathtub. The tub is perfect to get away from your group for a moment and relax in the privacy of your room. The Master is off a loft which has a pool table, queen size hide-a-bed, child's bed, and a TV/DVD. Another queen bedroom is off the loft area. Lake Tahoe has been my playground for 20 years. With all the traveling I’ve done, there is nothing compared to the amenities and beauty the Tahoe basin has to offer. I purchased my first home here in 1992 and decided to share it with others when not in use. I now offer other homes for your enjoyment. Each have hot tubs, most with pool tables and in locations that allows easy access to the Lake and Ski resorts. They were purchased for vacation rentals and are designed to be user friendly with all the amenities of home. I have a full time staff that includes cleaning, maintenance and will respond within 24 hours for all your needs. Feel free to call me about my other homes, or to just to discuss the perfect ski run on the perfect day. Can't beat the summer or winter here! I love my morning walks on the multitude of forest trails from the house. You can walk to the Lake, or up to the Tahoe rim trail right out the front door. There are also nice paths with great views of the Lake. The neighborhood is super quiet, yet right up the street from the Lake at Kings Beach, and easy drive to all the ski resorts. Northstar is the closest, but I ski Alpine and Squaw which is all highway going the back way. I miss all the traffic in Tahoe City and can get there is 15 minutes. Its also nice being right in the middle of the North Shore and can go anywhere easily even over to Heavenly Valley. The house has a nice aura about it. Its sunny and welcoming. Its great to sit on the couch with the fire going and watch it snow through the huge windows. Its like you're outside! In the summertime, I'll keep the sliders open and spent all day on the deck. I like good bedding especially after a long day skiing, so I keep this a priority in all my homes. The bedrooms are nice and big... great for all my stuff that I usually bring when I visit here. The kitchen and dining area really promotes entertaining which I've done many times here. It great to all hang out in the Great Room and all be doing something else, but all together. Can't say enough about soaking in the hot tub on the deck.... but I also love the jetted tub in the Master to get away from my group for a moment. I live in San Diego, and frequent my home as often as possible. I always feel so relaxed and sad when I leave here. Central heating. AC is not needed in Lake Tahoe. Yes. Everything is provided. The bedding is European style with high end cotton sheets, extra pillows on each bed with bed throw. You will sleep well here. Laundry room with washer/dryer, iron, iron board. Nice wood burning fireplace in center of living room. Dramatic open living area with expansive floor to ceiling windows. The perfect spot for entertaining. Everything you'll need for your group and extra. Large dining table and seats at the counter. Lots of books to read if you forgot yours. Big deck with wrap around seating and filtered views. The cabin was perfect for our needs. Very clean, nicely amenities, quiet neighborhood. Enjoyed sitting on the deck with our morning coffee and then in the evening with a glass of wine. Location was easy drive on the trails and Kings Beach. Sandy the owner was very attentive and communicated extremely well. We are looking forward to coming back next year..
Roomy. Good location. Well stocked. Had about eleven people in my group and we all slept comfortably. Kitchen was fully stocked with essentials for cooking. Home is a little smaller than portrayed in pictures but still very spacious rooms. Owner also let me check in early and check out late. Really good experience. Coming back Winter! Super cabin. High ceilings with views. Comfortable beds. The cabin was well stocked in the kitchen, bathrooms, etc. Instructions for everything. We're coming back here in Aug.
My family and friends loved the place. Plenty of room for the 10 of us and great location! We had a great stay. Management team was very attentive if we needed anything. House was perfect. It for sure met our family's expectations. Thanks for the review Joe. I hope you and your family can return for a future visit. The discounted rates for a 7 night stay don't show up on the calendar. For quote add your dates to quote calendar on the right.